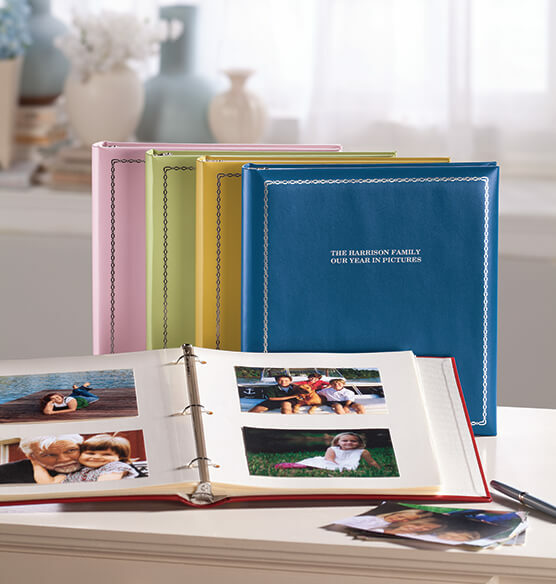 Preserve precious photographic memories with our contemporary Felicity Personalized Photo Album. This Felicity album features a rich, European bonded leather cover with a silver-tooled border on front and ivory bengaline lining. 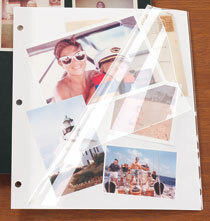 Arrange up to 40 album pages any way you choose on three sturdy metal rings. Identify your photobook with beautiful silver engraved text (up to three lines). 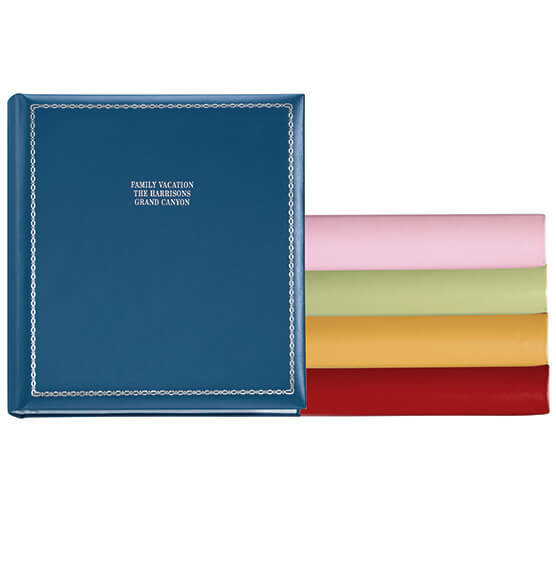 With up to 17 color choices, you can easily create a color-coordinated set of customized albums. I bought this for my new nephew so my sister would have a place for all those photos you don't enough wall space for. Being I could personalize it with his name it's his own and a wonderful keepsake album. I loved it for her so I bought one for my kids too! This book was obtained for 8 family members to build a Family Cookbook. 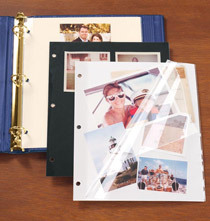 Photos are also included, but the 3 ring binder format allows you to add more recipes each year. The customization on the front makes it a special keepsake. It wasn't necessarily the product that caught my attention, but it was the customer service. I needed the gift to be delivered so I could put it together for my girlfriend's bday surprise party. There was a delay in the warehouse, but Exposures apologized and upped my shipping to next day air. The album arrived in the nick of time and I was able to put it together and give it to my girlfriend at her party. Exposures had me worried, but in the end, saved the day. I LOVE this product for coordinating my daughter's events (dance, gymnastics, etc.). Each event gets their own album. Each year gets its own color. It's a great line of albums. I love everything about them! Very nice looking albuumn. As with many exposures memo albumns, if you use photos smaller than 4X6 size the photo falls thru or flips around in the albumn. Works best if you put removable sticky dots on the back of the photo so it stays in place. I am pleased to show my daughters beautiful wedding photos in this stunning pastel blue album. The imprinting in silver is so pretty. I will definitely buy again and again. Using for a scrapbook with full pages. Beautiful quality but when we placed the maximum recommended pages in book, it was a tight fit. I would reconsider the maximum recommended pages & use less. I have purchased several of these to hold portraits of my children. I love having the ability to add pages as needed (3 ring design) and keep all my photos organized. A great product for a great price. I love using this product to store photos. I personalize each to track and organize my photos. Beautiful album, very well made and will sustain through the years. You only have so much wall space for 8 x 10 family photos so purchased this album for my daughter to organized her family pictures as she takes them off the wall and replaces them with updated pictures. Think she will love it. I purchased this album and THEN read the reviews for it. I was disappointed with peoples comments about quality and personalization. I thought that I would receive my album and hate it. I was pleasantly surprised when it arrived. My album is beautiful and seems durable. I really like the personalization. I will be ordering more albums to add to my collection! We ordered 10 albums for our wedding photos and they turned out great-they are not albums that I would want kids playing with or going through often as they don't seem like they would hold up through a ton of wear. This type of album is a great addition to my own hand-made albums. I especially appreciate the option of having it engraved. My only wish is that they would also have the option of engraving the spine of the albums. I bought this album to use as a scrapbook for my baby and it is working great. Loved that it came in a variety of colors. I bought it on sale and was happy with the product at the price I paid, especially since I could get it personalized. Would make a great personalized gift for someone too. I have been scrapbooking/photo journaling for over 10 years for my 3 boys. Each year I purchase a felicity album for each of my boys. I do agree with previous reviews about the quality of the engraving. It is inconsistent and sometimes blurred or crooked. Engraving could definitely be improved upon. However, the overall quality of the album is better than average. Most albums fall apart over the years or the pictures are ruined because the album is not true archival quality. I have not had that problem with Exposures. I do think they are expensive and should include the 10 insert pages like they used to when I first started archiving for my boys. [...] I have switched to digital photo albums through Mac (which I highly recommend, great quality and shipping prices) but still archive the boys school work, projects, art, etc... If I could find a local album that offered the same quality and price I would no longer order on-line. I would give it about a 3.5 overall. I would recommend the album to a friend with a disclaimer including the above statements. I just received my order today. I do like their choice of colors and personalization. However, I ordered three different colors and one came in incorrectly. Then my blue album rubbed against my hot pink album and made a scratch that will not come off. For the price, I can find the same product for less money and I won't have to worry about it getting damaged. I bought 2 albums: one in navy to use as a family recipe binder and one in hot pink to use as a quick reference book with phone lists, frequently viewed school papers, etc. They are nice, but not worth $100 for two of them. The personalization lettering was slightly smudged and not completely crisp. The inside coloring does not match the outside color as they have in the past; it is a generic white. The hot pink is not the bright, bright pink that is depicted in the catalog and on the Internet. It's okay, but not the color I thought I was getting. I can't comment on the navy color because I haven't received it yet. I ordered it almost a month ago. I have been ordering from Exposures for years and their products are unique, but are average quality. We have bought Exposures albums for many years and have routinely purchased 3-ring leather personalized albums. Last year, our album of choice was replaced by the Felicity album. The previous album featured better quality leather, more padding, and color-matched lining for about the same price. The ivory lining that now is used in all the albums, regardless of color, cheapens the look. We very much preferred the previous album. This book is a nice size, only complaint is that the personalization is delicate and thin. I wonder how it will hold up-seems like it could rub off over time. I started buying these albums a few years ago, I have 4 children so I purchased a different color for each child. I like the name on the front, and being able to label the spine with a volume patch. You should beware of two things though before investing a small fortune, like I have, in these albums. First, the spine patch does not stay on. I have two missing ones, and have to keep re-applying them. Finally I bought super glue and glued them to secure them. The other problem I had, is I purchased my daughter's first pink one about two years ago. Then I ordered her volumes2-5. When they arrived, I noticed the pink was DIFFERENT from the first one. [...] That really bothered me because I have purchased almost 20 of the Felicity albums. I don't like looking on the bookshelf and seeing the pink one a shade different from all the others. I am not sure if other colors are like this as well, but be aware that if you order a few and then order more they may not match. Where is the refill pages? The photo album is great, but for the price it should come with refill pages. I was very disapointed it did not. After buying a few Christmas Memories albums I decided to purchase a personalized Felicity album as a gift. Sadly, the material is nothing like the previous albums I purchased- doesn't even look or feel like leather. Hopefully the Christmas albums haven't changed- but due to the quality of these specific albums I would not give them as a gift! The album was described and priced as elegant. It actually is far from elegant. Basically a cheap variety store binder. The quality of the leather, the binding and the way it is constructed is beyond disappointing. I received this as a gift and would not recommend it. Very poor quality. Personalization is extremely cheap looking. Basically "rubs" off. Thought it would have been engraved for the price. Album material looks cheap. Complete waste of money. Bought one as a gift and recieved one as a gift - disappointed all around. Embarassed to have given it as a gift. Wouldn't use this company again! Their customer service was not helpful and a wee bit rude. I was not at all happy with this product. I feel it is greatly over priced for the quality. I would have returned it had it not been personalized. The album fell apart after a years. The company won't do anything about it.it was an expensive item. I received this as a gift from my sister. Wonderful idea, but the printing on the cover was fuzzy/of poor quality and inside quite a few of the pages were bent and even torn. [...]We are very disappointed [...]. I bought this as a gift for my husband to store his autographed photos. After owning another album from Exposurers I expected high quality contruction and extremely eye appealing. The construction is solid but looks cheaply made especially for the price.. I wish the other album I previously purchased was in red. previously purchased this album and is had held up beautifully! Do you have a photo album to hold 50 5x7 photos? BEST ANSWER: Thank you fro your question. The photo albums are sold separately from the photo pages. 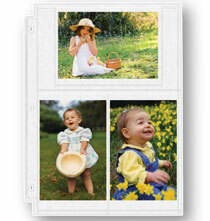 This allows customers to purchase photo pages that will accommodate whatever type of photos they want. 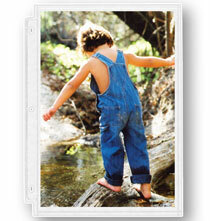 We do offer a photo page that holds 5 x 7 photos. We have included a link to this item on the website below. when will these felicity albums come in pink? BEST ANSWER: Thank you for your question. The Pink has been retired. We hope this information will be of help to you. is the blue color dark or navy ? BEST ANSWER: Thank you for your question. The blue color is a medium color like a cobalt. It is a lighter color than the navy. We hope this information is of help to you. Best Answer is Cobalt... yet there is another comment that says "It is Blue Navy". Looking for more Navy. All the blue albums I purchased from Exposures are a traditional Navy. The blue album I have is more of a cobalt blue. Hope this helps. what colors are available? Says there are 17 choices, but only 6 are listed as choices and 4 of those are not in stock. BEST ANSWER: Thank you for your question. The only colors available are in the drop down box. We hope this information will be of help to you. If there are not 17 colors available, Exposures should change the online text which says there are 17. I am looking for an album to hold 8.5x 11 pages--my kid's christmas letters to santa. Are there photo protector pages in this size for this album/will that size page work with this album? BEST ANSWER: Thank you for your question. Yes we have included a link below to the 3 ring white sheet protector page. We also have the clear slip in page that we are including a link to. We hope this information will be of help to you. Yes! I've bought many of these personalized albums over the year for my kids High School memories & I have bought the clear page protectors from Exposures and other places to hold pages, etc. Any 8.5 x 11 clear page protector with three holes will fit in these albums. how big is the ring in the album...1 inch, 2 inches, etc? Are there slipcases for these albums? BEST ANSWER: Thank you for your question. At this time we do not have slip covers for the albums. We hope this information will be of help to you. hi there are the rings the same as used for standard binders? BEST ANSWER: Yes, I transferred plastic protector sheets that contained 81/2 x 11 pages from a standard 3 ring binder to my new Felicity binder and they fit perfectly. Do you have a smaller album that holds 20 pages? BEST ANSWER: Thank you for your question. We do not have an album that would only hold 20 pages as the maximum. We hope this information will be of help to you. BEST ANSWER: Thank you for your question. The lime is a light green color that is more muted then bright. We hope this information will be of help to you. I purchased 5 packets of 'Double Weight Pocket Pages' for 3½" x 5" photos [415 BLU R 39], each packet with 10 pocket pages. The dimensions of the pocket pages are 9¾" x 11½". Will these pages fit in this album? BEST ANSWER: Thank you for your question. As long as the pages have 3 ring holes they will fit. We hope this information will be of help to you. What are the dimensions (width & height) of the pages that fit in this album? BEST ANSWER: Thank you for your question. Any of our 3 ring photo pages or Mylar sheet protectors will fit this album. We hope this information will be of help to you. If you do not want personalization, how do you choose that? Is the price the same? BEST ANSWER: Thank you for your question. The item number for non-personalized is 344066. We hope this information will be of help to you. I can't seem to see the "burgandy" color choice on the Felicity photo album can you advise? BEST ANSWER: Thank you for your question. Unfortunately the burgundy Felicity photo albums have sold out. Since we no longer have inventory and are not expecting further shipments from the supplier the item was cancelled. We apologize for any inconvenience this has caused you. We hope this information will be of help to you. I had purchased the purple previously and wanted to get another one but the drop down doesn't include anywhere near the colors shown. Will the purple be available again? BEST ANSWER: Thank you for your question. The purple is no longer available. We apologize for any inconvenience. which color is lime green?. the color selections are not clear at all? BEST ANSWER: Thank you for your question. The lime is the light green that shows the front cover in the picture. We hope this information will be of help to you. Can the Felicity Album hold 8x10 sleeves? BEST ANSWER: Thank you for your question. Yes the album will fit any standard 3 ring photo pages. We hope this information will be of help to you. There are three different "blues" pictured. When it says "Blue", what one am I ordering? BEST ANSWER: Thank you for your question. It is the top one in the picture, more a navy blue. We hope this information will be of help to you. There are several colors shown in the photo that are not shown in the pull down menu. Are these colors available? BEST ANSWER: Thank you for your question. Unfortunately not all the colors shown are available any more. All the colors shown in the drop down are the colors available to be purchased. We hope this information will be of help to you. Pink is shown in the picture of the product but is not in the pull down menu. Is it available? BEST ANSWER: Thank you for your question. Unfortunately no, it has been discontinued. We hope this information will be of help to you. How many pages will each felicity album hold? BEST ANSWER: Thank you for your question. Each of the Felicity album will hold up to 30-40 pages. Depends what pages are being used and how thick they may get. We hope this information will be of help to you. I Need this in black. Does it come it black? I'm matching to a felicity album I already own in black. BEST ANSWER: Thank you for your question. Unfortunately no, this item does not come in black. We hope this information will be of help to you. A few years ago I bought binders that were linen colored with brown binding that could be personalized. Do you have any such binders still? BEST ANSWER: Thank you for your question. Unfortunately we no longer have linen binders that are brown and can be personalized. We do offer ivory sheet protectors but they are not personalized. We hope this information will be of help to you. When will Lavendar color be available? BEST ANSWER: Thank you for your question. Unfortunately, we are no longer carrying the Lavender Colored Felicity Album. We hope this information will be of help to you. How many 4x6 photos or pages fit in the book? Will the book hold 250 4x6 pictures or is it too small? BEST ANSWER: Thank you for your question. The pages for the Felicity Album are sold separately and we do offer many different styles to choose from. We hope this information will be of help to you. How many pages fit in Felicity? Is the brown color still available in the Felicity album? I purchased several in the brown last year and would like to add top that collection. BEST ANSWER: Thank you for your question. Unfortunately no, this album is no longer being offered in brown.We hope this information will be of help to you. Is there a place where we can see the color name's labeled with the actual album color that corresponds to it? Last time I ordered a color based on the album I thought it would be and it was a completely different color. Since it was my "fault" for picking the wrong name associated I could not get this exchanged. I want to order a different color now but am afraid to guess what color I should be ordering. BEST ANSWER: Thank you for your question. For the corresponding color to the correct name in the overview box if scroll all the way down it will have the color listed with the name it is associated with. We hope this information will be of help to you. Which sheets for the Felicity Album hold 4X6 inch photos? BEST ANSWER: Thank you for your question. We are including links to a couple of styles of 4x6 pages that this will hold.We hope this information will be of help to you. You may also use the 3 ring sheet protector pages in this album, where you will mount your photos with a photo safe adhesive. How many photo pages will this album hold? BEST ANSWER: Thank you for your question. This album holds up to 40 – 3-ring photo pages, 3-4 sets. We hope this information will be of help to you. What is the shade of green in the primary photo? BEST ANSWER: Thank you for your question. Lime is the color shown in the primary photo. We hope this information will be of help to you. What is considered the bright green?